When Cathy Wray runs from her family, after seeing an advert in the newspaper for helpers at Papa Jack's emporium, she is scared but cautiously optimistic for the future. The emporium is a magical toy store which opens with the first frost of winter and closes with the flowering of the first snowdrops. At the heart of the emporium is owner Jekabs Godman (Papa Jack). Papa Jack along with his sons, Emil and Kaspar make wonderful toys, with more than just a touch of magic; toy soliders that seem to have their own personality and can seemingly fight battles on their own, Patchwork dogs and other animals that seem to be alive, and toy boxes that are bigger on the inside than on the outside. Cathy has never worked in any sort of shop at all, much less a wonderful shop with a fascinating and brilliant reputation as London’s ‘premier merchant of toys and childhood paraphernalia’. Papa Jack takes a chance on Cathy when she turns up unwittingly one opening night, their busiest of the year. She expects only to stay for one ‘season’ but the magic of the store captures Cathy’s heart at a time when she is at her most desperate. Her life is turned upside down by the emporium but that’s really all I can say without giving anymore away. The Toymakers is a magical novel that will truly capture your imagination and really does has something for everyone. 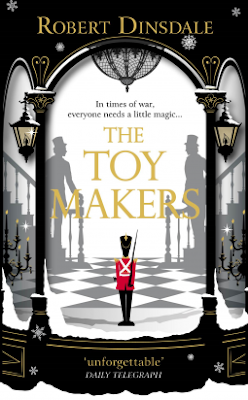 The Toymakers is available now via Amazon online and all good book shops.